Like most people my age, I grew up reading Charles Schulz’s Peanuts comic strip every day and watching the Charlie Brown animated specials on CBS. Though Linus’ brother Rerun and I debuted at roughly the same time and I’ve long been fond of the little kid, it was always Charlie Brown I identified with — he flies kites, I fly kites; he loves a little red-haired girl, I definitely love redheads; he can’t seem to catch a break, my life seems like an unending sequence of mishaps. I even have a yellow-striped t-shirt, just like Charlie Brown. A few weeks ago, BOOM! Studios announced that they were rebranding their acclaimed kids comics line as "kaboom!" 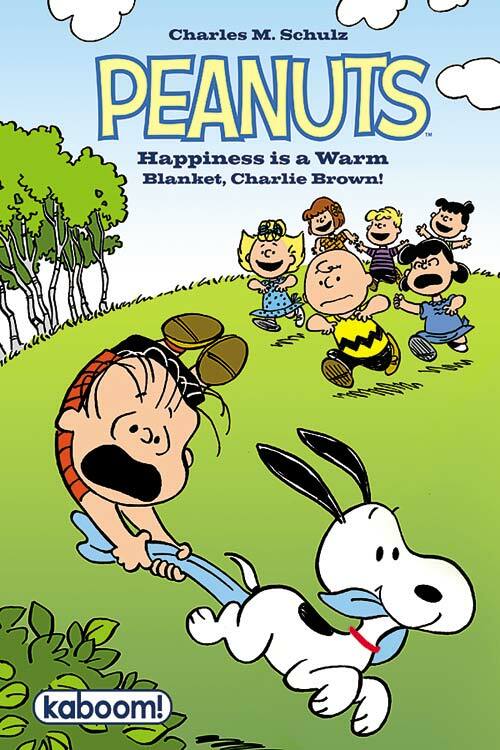 and the retitled imprint would debut with a brand-new Peanuts graphic novel — Happiness is a Warm Blanket, Charlie Brown! Even though Schulz passed away in 2000 and no new Peanuts strips have been produced, Happiness is a Warm Blanket is Schulz through and through; Schulz’s son Craig worked with Pearls Before Swine‘s Stephan Pastis to adapt several classic Peanuts storylines into a new animated special, and now that animated special is in turn adapted into the first Peanuts graphic novel! The artwork by Bob Scott, Vicki Scott, and Ron Zorman evokes the look of Schulz’s work, circa 1962, creating a story that would not feel out of place alongside A Charlie Brown Christmas. Peanuts is in good hands with kaboom!, and Happiness Is a Warm Blanket, Charlie Brown! makes me feel like a kid again, reading Peanuts every day in the newspaper and flying kites on a warm spring day.